Despite smaller conditions on the final day of the competition at the Hainan Classic, the Final was an action-packed, wave-for-wave affair. 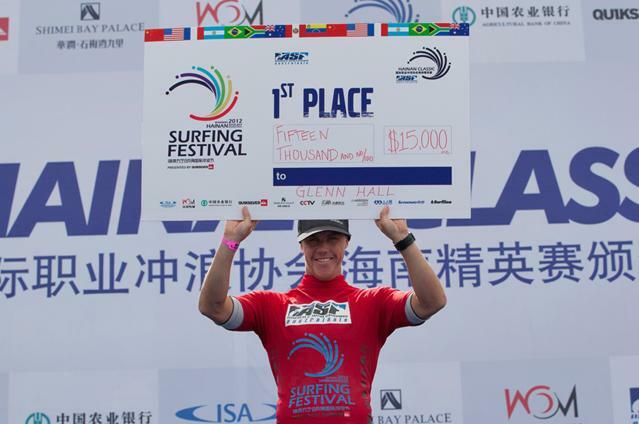 Glenn ‘Micro’ Hall (IRL) managed to take control early with a long, excellent-scoring wave mid-way through the heat and hold off Royden Bryson (ZAF) in order to be crowned the first-ever champion of the Hainan Classic, an ASP 4-Star organized by the ISA. Both surfers have been putting in countless hours over the last week getting to know the various waves around the contest area, particularly the barreling sand-bottom wave further up the point, which was getting comparisons to world-class waves around the world. All that experience proved vital on the final day of action of the inaugural Hainan Wanning Riyue Bay International Surfing Festival presented by Quiksilver. Today, both surfers dedicated their morning to watching. Both were at the contest venue at first light to do research. In the first semifinal of the morning, Hall was up against Dion Atkinson (AUS), the powerful regular-stance surfer. Atkinson actually was the one to get off to the fast start, registering an 8.33, but he struggled to find an adequate back-up. Hall kept active, posting a 6.9 to close the gap, before stroking into one of the best set waves of the heat. After two big floaters and a couple of turns the wave came through at an 8.17, forcing the Australian to scramble. Atkinson’s wave in the dying moments of the heat wouldn’t be enough. In the second semifinal, Bryson managed to advance past Marc Lacomare (FRA), who’s been one of the top-performing competitors in the ISA’s two-event Surfing Festival. The South African was on the choice waves of the heat and tallied the highest total heat score of the day, at 16.87. In the final, Bryson wasn’t finding those same waves. It was Hall who kept most active and was finding the waves that lined-up all the way through the bay, allowing for multiple turns and maneuvers. Bryson did complete the trick of the heat, landing a perfectly executed double-grab air-reverse. Ultimately, Bryson couldn’t find the waves to out-point Hall, who was surfing fast and smooth on the best waves of the heat, for a total score of 16.33. Bryson had a few opportunities late in the heat, but finished with a score of 16.16. After the final, at the water’s edge, a pair of Australians was able to pull Hall away from the mob of Chinese media and chaired him up the beach. Hall spends half of the year living and training in Australia. "I’m stoked for Hally, he’s a good friend of mine, so I couldn’t have picked a better person to win the final, besides myself,” said Bryson, with a laugh. “All in all, I am just stoked to have come here; it’s an amazing place, and I cannot believe the quality of the waves. It’s a place I’ll definitely visit again in the future.” After the final, at the Award Ceremony, Hall was presented with the $15,000 USD winner’s-check and the ornate jade dragon trophy.